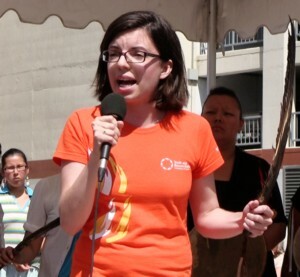 Churchill MP Niki Ashton gave an impassioned speech at the July 11th Winnipeg rally for a national inquiry into missing and murdered aboriginal women. In addition to posting the video, I’m providing a transcript because it neatly sums up this ongoing tragedy and the Harper government’s decisions that have served only to make matters worse. Our message is clear. There is an epidemic of missing and murdered aboriginal women in Canada. Let’s look at those statistics. Over 600 aboriginal women missing. One aboriginal woman is three-and-a-half times more likely to experience violence than a non-aboriginal woman. A young aboriginal woman is five times more likely to die from violence than a non-aboriginal woman in Canada. But this isn’t about the statistics. It’s about the daughters, the sisters, the mothers, the grandmothers, the friends that have gone missing. It is about the broken families and the broken communities and the people that are grieving. And it is time to recognize that we need action. We need a national inquiry into missing and murdered aboriginal women. International organizations have spoken out. Amnesty International — even the United Nations – are beginning to understand and have said they understand the magnitude of this issue. But where is our federal government? Not only have they failed to recognize the magnitude of this tragedy, they have cut the programs that would help to be part of the solution — the loss of Sisters in Spirit, the cuts to the Native Women’s Association of Canada, the loss of the National Aboriginal Health Organization, the loss of the Women’s Health Network, the loss of the Aboriginal Healing Foundation, the loss of the First Nations Statistical Institute. We need action and we need to find out what’s going on. We need an inquiry that will look into the underlying causes of why aboriginal women face so much violence. But in this darkness there is hope. There is hope that, with an inquiry and a call for action and a commitment to that action, we will be able to prevent this violence from continuing to take place. And more importantly, there will be an ability to bring justice to the memories of the women that have been missing, that have been murdered — to their families, to their communities. So we are here and we are not asking. We are demanding that there be a national response to a national epidemic. We are demanding a national inquiry. And we will not rest until we hear from the federal government — until there is a national inquiry to finally put an end — so that no aboriginal woman — no woman — dies because she is an aboriginal woman — in a country as wealthy as Canada — in the year 2012 and beyond. Thank you. Meegwetch. You SHOULD have included Premier Sellinger and the 12 year old NDP government in your admonitions! Precious little has been done to address this tragedy over the last 12 years (NDP all that time) !